15 spaces or less per line is best. Printing on Science Fair Medals is $.25 if all medals are the same, $.50 if printing is different on medals. Date you need you science fair medals. 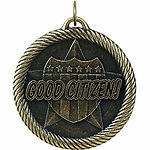 Two-inch Good Citizen Medals, the VM284 Medal comes with a 7/8 inch neck ribbon of your choice of color. In addition to the 7/8 x 30-inch neck ribbon we offer, a wide 1 1/2" x 32" neck ribbon. We have a wide color selection, also available is a 31" metal chain. You may select antique gold, silver, or bronze color medals. You can make all your selections as you scroll down this page.